Joe Des Lauriers has very kindly sent me this month's issue of Wooden Boat magazine, which contains a splendid account of Sam Manning's trip under oars and sail from Gloucester, New Hampshire, up the east coast and round Nova Scotia, in the summer of 1955. 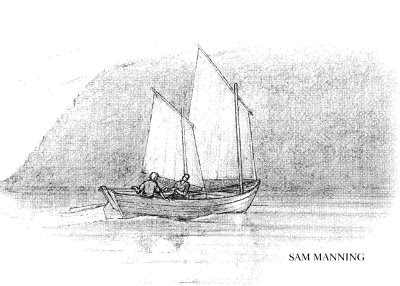 Sam had rescued a 23ft seine dory from dereliction and rigged her as a dipping lug schooner, and persuaded an old navy friend to accompany him on his voyage north. There were two main obstacles. One was getting across the isthmus that joins Nova Scotia to the mainland - accomplished by going ashore, finding a farmer with a tractor and a trailer, and giving him $10. Getting to that point through the Bay of Fundy required a navigational rethink. The tides there are among the highest in the world at 17m, rushing in from the Atlantic into the bottleneck between Nova Scotia and New Brunswick. A drunk they discovered living under the town wharf at Jonesport proved an unexpected source of knowledge, having traded timber under sail in the Bay. He told them: "Don't get caught when the tide turns. Be sure to go up with the tide and grab onto something when it turns." A great tale. Pop out and get April's Wooden Boat before the May issue arrives. The article is by Donnie Mullen.